Iran has its sights set on putting an astronaut on the moonby 2025, after becoming the first Islamic nation to put its own payload intospace last year. But the grand goal of getting to the moon may be among the leastof the benefits Iran expects to reap from its expanding space program. Iran's motivations for a space program are most likelypractical: developing possible ballisticmissile technology and building international prestige as a message tofriends and enemies alike, analysts say. "They will clearly use dual-use technology for a militarybuildup, and as long as they at least dabble in human spaceflight, they getadvantageous press coverage on that as well," said Joan Johnson-Freese, professorof National Security Studies at the Naval War College in Newport, R.I.
Iran launched its firstdomestically built satellite in February 2009 and promises more satellitelaunches in 2011. It also has offered to help any other Muslim countries withdeveloping their own space programs, according to a FAQ recently compiled byTiffany Chow, a researcher at Secure World Foundation, a watchdog group basedin Washington, D.C., that tracks space security issues. Such political signals may serve Tehran's purpose even if thecountry lacks the technical capabilities to back up its intentions, analystssaid. "Given the current state of Iran's launch capabilities,it is unlikely that they'd be able to develop a human spaceflight program andsuccessfully send an Iranian to the moon by 2025," Chow pointed out. Several earlier launch attempts by Iran appeared to faildespite the country's claims otherwise, according to the Secure World FoundationFAQ. The rocket technology involves a mix of North Korean and Soviet missiledesigns. 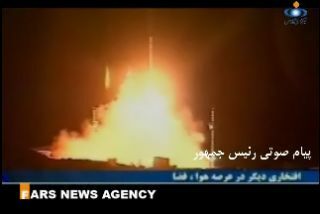 The first launch attempt involved a two-stage rocket named Safir("Ambassador" in Farsi), with a dummy satellite, Aug. 17, 2008. Therocket failed shortly after liftoff, according to outside analysts. Confirmed success finally came with the launch of theSafir-2 rocket Feb. 3, 2009. That rocket placed an Omid satellite weighing some44 to 60 pounds (20 to 27 kilograms) into low Earth orbit. The cube-shapedsatellite is almost 16 inches (40 centimeters) on each side. Another launch attempt, this past Feb. 2, involved a Kavoshgar("Explorer") sounding rocket designed to climb just 62 miles (100kilometers). The sounding rocket — a rocket designed to collect data ratherthan transport cargo — had a living payload consisting of two turtles,a worm and a rat that were supposed to parachute back down to safety. Nosolid proof of the launch's success ever emerged. Iran had played up the event by launching the rocket fromthe back of a military truck rather than one of the country's four designatedspace launch sites. The Defense Minister, Gen. Ahmad Vahidi, oversaw the launchand issued a warning that Iran would not tolerate "any unpeaceful use (ofspace) by any country." Such portrayals by Iran of its launches are in starkcontrast to "repeated delays in their space program and failures notdiscussed," according to Charles Vick, senior technical and policy analystat GlobalSecurity.org. Iran announced it will launch its 89-foot-long (27 meters) Simorghrocket, also known as Phoenix, which has a liquid fuel propulsion systemcapable of carrying more than 220 pounds (100 kg) to an altitude of almost 311miles (500 km). The Simorgh rocket can carry a new generation of Iraniansatellites such as the Mesbah "Lantern" cube satellite, which measuresalmost 20 inches (50 cm) on each side and weighs between 132 and 165 pounds(60-75 kg). But Russia reported that the Mesbah-1 satellite neverarrived for launch, and in July 2009 it announced its refusal to launch anymore Iranian satellites. Italy similarly refused to help. Mesbah-1 disappearedand has since been replaced by Mesbah-2, built by Iran largely using theItalian design. "Some of Iran's domestic launch capabilities are indeedinspired by, and to some extent based on, foreign models and systems,"Chow told SPACE.com. "Based on recent Iranian claims, though, it appearstheir newest launch vehicles and satellites are indigenously designed andconstructed." The Tolu ("Sunrise"), due to launch in 2011, wouldbecome Iran's first remote-sensing satellite. "Direct evidence of assistance, education and hardwaretransfer from the Chinese to the Iranian and North Korean defense and space (industries)has been witnessed on large scale within China's military industrialinfrastructure," Vick said in an e-mail. North Korea has been focusing mostly on missile development,as opposed to space, given their failures to achieve sustained orbit for anysatellites, Vick noted. Meanwhile, Iran'sballistic missile program has been moving like "gangbusters," headded. But Vick compared the intentions behind China's five-yearplan and Iran's three-year plan for space to the Apollo moon program of the1960s. The Apollo and other U.S. civilian programs helped push ahead basicsciences and military technologies to keep the United States? "severalgenerations ahead of our adversaries," Vick explained. Johnson-Freese suggested Iran sees a space program as a"win-win from both the technical and techno-nationalistic politicalperspectives," considering how missile and rocket development gohand-in-hand. Whether or not that gets them to the moon may be beside thepoint. "The bottom line is, I think Iran's human spaceflightplans are mostly talk, but any part that isn't will be a bonus to them,"Johnson-Freese said.